St James Hotel likes to do things differently; from a baby grand piano in its penthouse suite, reminiscent of the palazzos of Venice, to its in-house art gallery and exquisitely eccentric furniture by Imperatorum – an exclusive British brand inspired by travel and a sense of wonder. It is a natural choice, then, for a hotel that stands in the centre of a UNESCO City of Literature, steeped in the legend of Robin Hood and his band of Merry Men. Design-led rooms at St James Hotel range wildly (of course they do) from price-conscious crash pads to a fabulous four poster, yet all enjoy free Wi-Fi, LCD flat-screen TVs and complimentary bathroom amenities from The White Company. And there’s 24-hour room service should you crave a midnight bite. No/6 is the boutique lounge and bar that offers a small but distinctly satisfying food menu, and bookish surrounds where you can sip a beautifully blended signature cocktail (try the No/6 Fix with bathtub gin), or crack open a limited-edition bottle. So grab a book, kick back, and relax. The hotel’s in-house Left Gallery exhibits artists from around the globe. Plus, did we mention that Nottingham Castle, Museum and Art Gallery is a minute’s walk? Staying at St James Hotel, you really do enjoy an unrivalled location. Refreshingly, parking is available next door to St James Hotel at the NCP St James’s Street car park. Nottingham Train Station is a 10-minute stroll, passing Broadmarsh shopping centre – with access to the City’s vast network of caves – before crossing the canal. St James's 87 boutique-style rooms range from brightly-accented, minimalist-chic crash pads for an overnight stay, to high-end, Italian-inspired The Penthouse, when you want to pull out all the stops - there's a Jacuzzi bath for 2 and a walk-in rain shower in its en suite bathroom; a late-19th Century baby grand piano and 24-hour private dining in its burr-walnut-floored lounge; and, on waking, if you gaze out of the luxuriously draped windows, you can see Nottingham Castle. Whichever room you choose, however, you're assured of free Wi-Fi, LCD TVs (with 50 Freeview channels), writing desks and laptop safes; plus, complimentary toiletries from The White Company in your private bathroom. Room service is available. Wake up inspired. Wake up with Classic British Hotels. 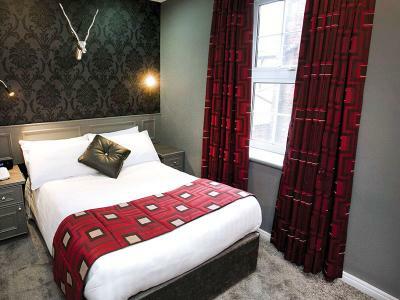 Our Crash Pads are value hotel rooms in Nottingham that offer the perfect space for a comfortable overnight stay. Bright and youthful in design, they provide the ideal space for a single traveller to bed down for the evening. 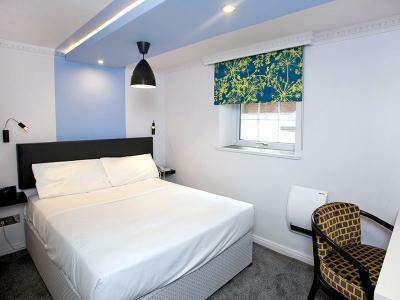 Whilst being suitable for only one adult, each room still has a double bed, en suite bathroom, LCD television, free Wi-Fi internet and complimentary toiletries from The White Company. Classic rooms are larger than compact doubles and are styled to a higher standard. Matt blacks and deep, dramatic reds are carried through to the black brocade feature wallpaper punctuated by handcrafted steel stag heads. 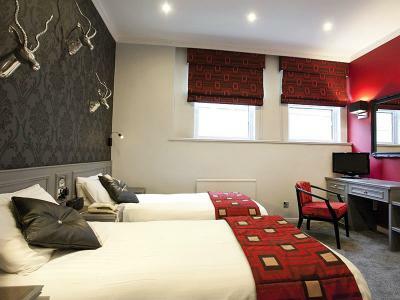 The Classic Rooms are available with either one double sized bed or two single beds. 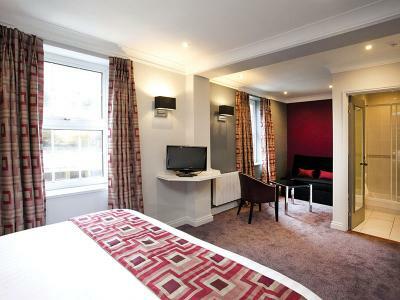 We also offer an accessible Classic Room, which is fully DDA compliant for guests with special needs. Classic rooms are larger than compact doubles and are styled to a higher standard. Matt blacks and deep, dramatic reds are carried through to the black brocade feature wallpaper punctuated by handcrafted steel stag heads. The Classic Rooms are available with two single beds. 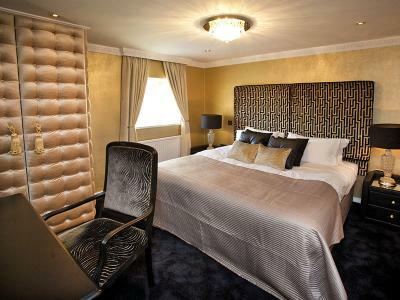 We also offer an accessible Classic Room, which is fully DDA compliant for guests with special needs. Executive rooms are larger than classics - they feature an additional seating area with a coffee table and a sofa bed - and enhanced amenities, such as a Nespresso coffee machine. These rooms are ideally suited to families, accommodating up to 3 adults and 1 child, or 2 adults and 2 children. This one-of-a-kind room is the perfect way to show them how much you care. High ceilings, elegantly upholstered furniture and a luxuriously draped four-poster bed may well transport you back to the time of Richard the Lionheart. Need we mention the spa bath? 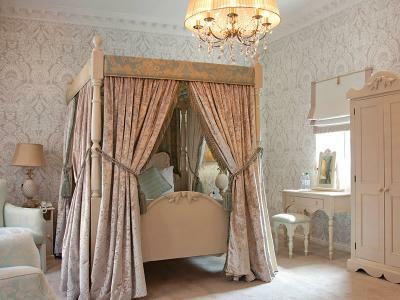 Period style en suite bedroom. 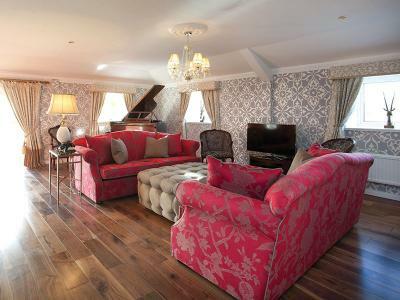 The choice of celebrities, this exquisite suite is quite simply the finest hotel suite in the city. With burr walnut floors, antique furniture, dining table for 8, a huge Jacuzzi, and even a baby grand piano – it’s the ideal way to treat a loved one. The room, with views overlooking Nottingham Castle and beyond, also makes a perfect venue for a cocktail party or private dining. At junction 24, take the A453 exit to Nottingham. At the roundabout, take the 5th exit onto Remembrance Way/A453. Continue on the A453 to Nottingham city centre. Once near the city centre, follow the brown tourist signs for Nottingham Castle. When close to Nottingham Castle, turn off Maid Marion Way and head towards the Castle gates on Friar Lane. Drive to the end of Friar Lane and follow the road sharp right (with the Castle gates on the left side of the road at that corner). Upon turning right, take the next road on the right (after 50 yards) onto Rutland Street. The hotel is on the left, before the entrance to the NCP car park. Should you wish to park in the hotel's car parking spaces (subject to availability), please park beneath the NCP multi-storey car park. These spaces are located between the hotel and the ramp heading up to the NCP car park. Ample parking is available at the NCP St. James's Street car park next to the hotel for a discounted price of £11.00 per 24 hours. The book-lined lounge and bar at St James's Hotel is a stylish affair. Over 500 books give a collective nod to Nottingham's unique UNESCO City of Literature status (one of only two cities in England) and add a timeless quality to a contemporary space. Dining and drinks can be enjoyed in equal measure at No/6: Start your day with rich, locally roasted coffee and home-made granola with yoghurt. Or opt for the full St James. For lunch, enjoy a light bite; a platter (choose from charcuterie, cheese, fish, and bread); or perhaps a main such as Thai green chicken curry. The field mushroom and parmesan creamed leek wellington is a winning veggie option. Lovingly curated, the drinks menu betrays a passion for classic cocktails, boutique spirits and craft ales; little-known names and limited-edition bottles can all be found here. You can pick your perfect mix from around a dozen signature cocktails, or go off-menu and order something a little more unconventional. No/6 is a singular spot to crack open a book and a bottle. Quaff the weekly guest ale (Friar Tuck would approve) with your ginger-battered fish and chips, or sip a late-night James Royal to round off your city excursions. Eat, drink, and be merry, but drink responsibly as our guest, or you'll have to answer to the dastardly Sheriff of Nottingham. The unique surroundings of St James Hotel present a wonderful setting for private dinners and celebrations. The hotel caters for reunions, anniversaries, family gatherings, birthday parties, charity and club events, and business dinners. Choose from a range of private rooms, each with its own individual character. Call Classic British Hotels on 0844 967 0984 for advice and let us help you organise a memorable private dinner. Self-styled as a dark and sinister place, a certified paranormal hot spot (#WhoYouGonnaCall), Nottingham's old courthouse and gaol serves up tours like a sentence-obsessed judge amid a crime heatwave - ghost tours, terror tours, prisoner tale tours, villainous sheriff tours, facts and felons tours, and more. There are free exhibitions too, including 'Robin Hood: The Rise of a Rebel' - perfect for families. This ghoulish curiosity of crime and punishment was deservedly voted England's 'Best Small Visitor Attraction of the Year' in 2014. "Take aim. And loose!" You don't need to be an eagle-eyed archer to hit Nottingham Castle with St James Hotel as your vantage point. A 50-metre stroll from the hotel and you'll arrive at the castle grounds, where a statue of the 'Hood' greets you - bow drawn, arrow primed. Shape-shifting Nottingham Castle has assumed many forms down the centuries. It began life as a motte-and-bailey Norman incarnation, before being rebuilt during the reign of King Henry II - at its height it was one of the most important castles in England. According to legend, it was the scene of the final showdown between devilishly handsome Robin Hood and the diabolical Sheriff of Nottingham. In its present form, Nottingham Castle is chock full of everything from British and European fine art, to costume and textiles. Robin Hood castle cave tours take you deep underground, enriching your insight into the turbulent history of this once royal citadel. The Robin Hood Pageant and the Robin Hood Beer Festival are held here each year. Part of over 500 sandstone caves that date back to the Dark Ages, it is thought that Nottingham's poorest called them home from as far back as the 11th Century. In 1845, however, the St Mary's Enclosure Act put a stop to all that, banning the rental of cellars and caves. Today, no longer a smelly subterranean cesspool, you can sign-up for a guided tour with Archie and Annie, the caves' archaeologists. As you descend into the dark heart of Nottingham's secret past, they'll weave a rich tapestry of tales that reach and echo through the city's ancient arteries into the present. Discover a world beneath your feet. With more man-made caves than anywhere else in Britain, Nottingham really is the city of caves. There are plenty of reasons to meet at the St James Hotel, in Nottingham city centre; from the fun (quirky sense of style, eclectic design, cultural kudos - in The Left Gallery, oil paintings sit alongside video art), to the functional (prime location, plentiful on-site parking, free Wi-Fi), but it is, perhaps, the combination of these factors - and 2 magnificent ballrooms housed in a dedicated conference centre overlooking Nottingham Castle - that clinch the deal. Plus, spacious executive rooms with super-king-sized beds, work and seating areas, and Nespresso coffee machines, provide welcome retreats after a fruitful meeting or an exhilarating event. A 10-minute walk to the train station - arriving at London St Pancras International in less than 2 hours, direct - and a short 15-minute drive to the M1 motorway, St James Hotel is a firm favourite with guests that need function, but don't want to miss out on the fun.